Pete Souza/White House/ReutersPresident Barack Obama listens to Secretary of Defence Leon Panetta in the Situation Room while discussing the mission against Osama bin Laden. In his memoir Worthy Fights: A Memoir of Leadership in War and Peace, former Secretary of Defence Leon Panetta describes the stealth 2011 assault on Osama bin Laden’s compound in Pakistan. Panetta had a unique vantage point on the raid, which he watched remotely from the CIA’s headquarters in Langley, Virginia. One of the first hiccups was the accidental crash landing of one of two SEAL helicopters as they arrived at the compound at approximately 12:30 a.m. local time (3:30 p.m. EST). The SEALS transitioned to a backup helicopter and, as we all know, they were able to carry out the rest of the mission. The disabled chopper, which lay in an animal pen, was later blown up after the successful capture of Bin Laden. 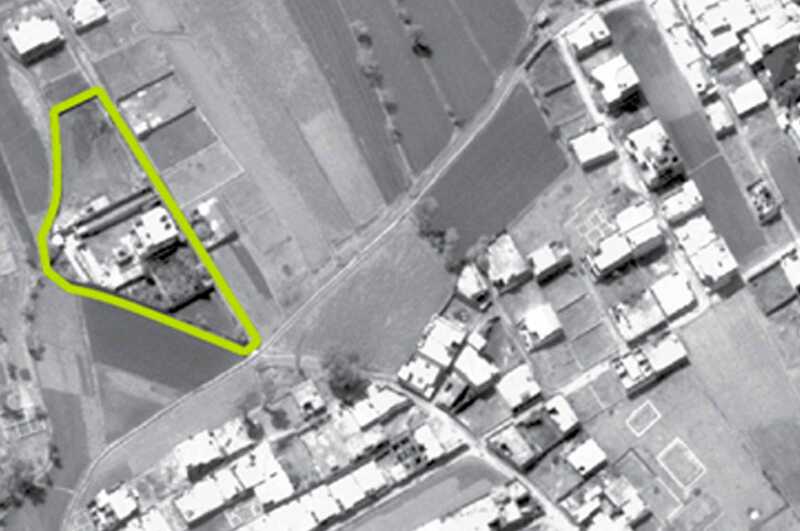 Department of DefenceAn aerial view shows the compound that Osama bin Laden was killed in, in Abbottabad, Pakistan. Between the second and third floors, a bearded young man whom the assaulters recognised as Khalid bin Laden, bin Laden’s son, was shot and killed. As the SEALs moved to the third floor, a tall, bearded man poked his head out of a doorway. A member of our team, recognising him instantly, shot at him and missed. The man disappeared back into the room, and an AK-47 was visible in the doorjamb. Team members moved towards the door. As they moved inside the room, two young girls and an adult woman rushed the SEALs. Our operator grabbed the girls and shoved them to the side as they screamed in fear. One woman shouted at the man upstairs, calling him “sheikh.” Our team members saw the bearded man and shot him twice, once above the left eye and once in the chest. 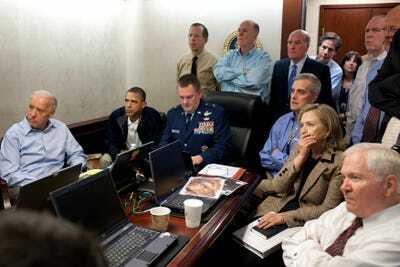 A woman in the room, whom we later learned was bin Laden’s third wife, was shot in the leg, but not seriously wounded. All of this took about 15 minutes. The time in Pakistan was approximately 1 a.m. local time (3:51 p.m. EST) when Navy Admiral McRaven Commander of SEAL Team 6 relayed word to the remote security team that there was a preliminary call of “Geronimo,” which was the code word for the successful killing or capture of Bin Laden. “I was not clear in that moment whether that meant we had taken Bin Laden prisoner or killed him. I asked for confirmation. Geronimo, he repeated. E.K.I.A. Enemy Killed in Action. A few moments later, the SEALs reappeared on the screen, six of them dragging a body bag to the helicopter,” Panetta wrote. Pete Souza/White House/ReutersPresident Obama watches with members of the national security team on the mission against Osama bin Laden in the Situation Room of the White House, May 1, 2011. “Our men were still deep in Pakistan, surrounded by danger, a long way from home and the situation on the ground was growing more tense and complicated by the minute. 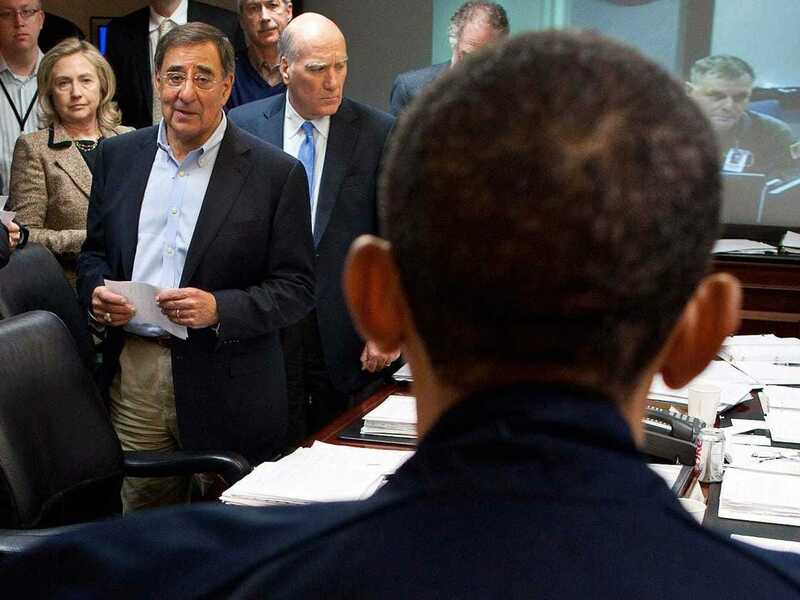 The explosions and gunfire from the compound had begun to draw the attention of our neighbours, and they came into the street, some venturing toward our forces,” Panetta wrote. Once all the SEALs boarded the Chinook helicopter with Bin Laden’s corpse, they began taking DNA samples to confirm his identity while en route to Jalalabad, Afghanistan. At this point, the mission was three hours in and the SEALs now faced the critical and grave task of making sure they did in fact kill Bin Laden. A team member took photographs of his face, immediately subjecting them to photo authentication. Others tried to measure the corpse, but no one had thought to bring along a tape measure — proof that no matter how much anyone plans, some thing is always forgotten. Instead a member of the team who was just over 6-feet tall lay down beside the body and determined that it was a few inches taller than he. All that took less than half an hour, and at 6:20 p.m. McRaven declared that there was a “high probability” that it was Bin Laden. The DNA samples from the corpse later would establish beyond any doubt that we had in fact killed Osama bin Laden. 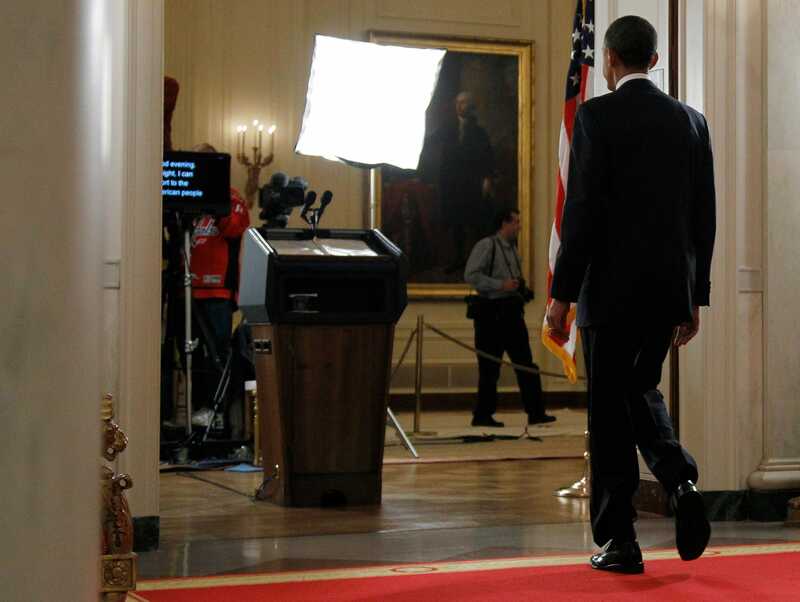 Jason Reed/ReutersPresident Obama walks towards a camera in the Blue Room to deliver news to the nation that Al Qaeda leader Osama bin Laden has been killed. Meanwhile, Bin Laden’s body was was prepared according to Muslim tradition and was placed in a heavy black bag along with 300-pounds of iron chains to ensure the body would sink after it was dropped into the ocean. Shortly after 11:30 p.m., President Obama addressed the nation and announced the death of Osama bin Laden.